"They've played and won three since biting the Butler bullet, which is as clear a sign as is needed that his abrasive character was impeding the younger talents on his team. Taking out Brookyn, New Orleans and Portland in the first three of a five game home stint, Minnesota have moved to 7-1 at home, and 4-1 in last five against the spread." Someone at Sky really likes the Timberwolves. Not that I'm complaining, because Minnesota are in an intriguing spot post the Jimmy Butler trade. Even before he was finally dealt to Philadelphia, it was clear that Minny's other true star, Karl-Anthony Towns, was a better player without the former Bull in the line-up. 23-year-old Towns was averaging almost 10 points more per game when his senior colleague sat this season prior to the Sixers trade. 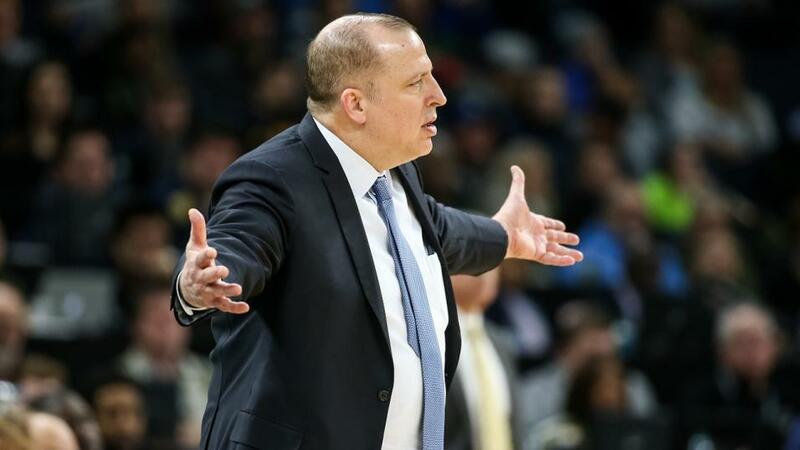 Now, coach Tom Thibodeau has given up on the tribute act to his old Chicago team, and it has to be in the best interests of the club, if not necessarily Thibs' long-term prospects in the North Star state. The Western Conference is so tough now - all five teams in Minnesota's division have legitimate playoff designs - that their rough start will likely cost them come May, and that probably means the coach will be replaced in the personnel director role, at the very least, come the offseason. Still, they're fighting now and can turn things around. They've played and won three since biting the Butler bullet, which is as clear a sign as is needed that his abrasive character was impeding the younger talents on his team. Taking out Brookyn, New Orleans and Portland in the first three of a five game home stint, Minnesota have moved to 7-1 at home, and 4-1 in last five against the spread. Maybe they can put things right with a strong pre-Christmas run. They welcome another tough opponent to the Target Center in the Grizzlies, who lead the league in defence. On an impressive run themselves, only Utah have beaten them in their last five games, meaning they've taken down, Denver, Milwaukee, Philadelphia and Sacramento, covering the handicap margin in each of those wins too. Not bad at all. Portland head to DC for the third game of six straight on the road and will be pretty desperate for a win after losses to the Lakers and Timberwolves in their last two. That form should give encouragement to a Wizards team that definitely needs it. They're scrambling back toward respectable mediocrity, posting three wins in four, after a dreadful start, but those wins are coming against some of the weakest fare in the league. Last time out, on their own court, they were whipped by Brooklyn. Their morale from night-to-night looks very questionable. Portland are clearly the better team here. CJ McCollum's shooting is down on the season, but Jusuf Nurkic is posting solidly at center, and Damian Lillard is still scoring as well as ever. They're 10-5 on the season, but only 3-7 against the spread on their last ten away trips. Still, with the line so short, I'd rather be on the better team. Take the Blazers -1 at [1.94]. Thankfully we've got some drama around the Warriors. Draymond Green ignited a season that threatened to be a procession - and likely still will be - with his open feuding with Kevin Durant last week. With Durant mooted to be heading for free agency next summer, the longer-tenured Warriors are finding it hard to embrace him this season, and it all spilt on to the court against the Clippers. Green was suspended for the next game, and now a "lingering toe injury" is being used to explain his absence in last night loss to Dallas and another probable one in San Antonio tonight. That's not all. Stephen Curry is out with a groin complaint too. They're 2-4 in their last six games and 1-5 against the spread after losing just one game in their first 11. The 86 they posted in Houston on the first leg of this three-game Texas trip was their lowest total of the season by 13 points. Which makes things interesting, but the Spurs aren't in much better form. One win in six, just two covers in the same run, their defence isn't up to the standards we expect from them and trying to fit DeMar DeRozan and LaMarcus Aldridge in the same line-up and keep them scoring is proving difficult. If anyone can solve the conundrum it's Gregg Popovich, but for now they're on a bit of a slide. This is the second road game of a back-to-back weekend for GSW, and their fifth game in seven days, so that accounts for the fact that ths Spurs are being priced up as favourites here. Given San Antonio are working through their own problems, I have to take the Warriors getting points here despite the hectic schedule. I would take Golden State +2.5 at [1.92].